For the Royal New Zealand Ballet. Photo credit: Stephen A'Court. COPYRIGHT ©Stephen A'Court Wellington, NZ. 16 August 2018. 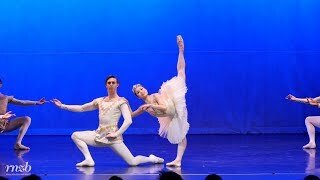 Strength & Grace by the Royal New Zealand Ballet. Photo credit: Stephen A'Court. Mayu Tanigaito joined the RNZB in 2012, making an immediate impression on New Zealand audiences in Larry Keigwin’s Final Dress. 2018 was a busy year for Mayu, who appeared as Nessie in Jiří and Otto Bubeníček’s The Piano: the ballet, and in solo roles in all four works in the Dancing with Mozart mixed bill, including an extended pas de deux in Corey Baker’s The Last Dance. She ended the year as both the Sugar Plum Fairy and Dewdrop in Val Caniparoli’s The Nutcracker. She has performed principal roles in the classical repertoire including Carmen by Roland Petit (2017), Juliet in Romeo and Juliet (2017) Kitri in Don Quixote, Giselle and Myrtha in Giselle (2015, 2016), and In the Middle Somewhat Elevated, all of which garnered critical acclaim.Other leading roles have included Swanhilda in Coppélia, Pas de Trois and cygnets in Swan Lake, Flower Festival of Genzano pas de deux, Carnival of Venice pas de deux, and in Balanchine’s Who Cares? and Allegro Brillante and the Wicked Witch of the West in The Wizard of Oz. She has performed works by New Zealand and international choreographers including Benjamin Millepied, Ethan Stiefel, William Forsythe, Francesco Ventriglia, Andrew Simmons and Neil Ieremia. Liam Scarlett created the role of Moth on her for his A Midsummer Night’s Dream, a role she has performed in New Zealand, and Hong Kong. At the end of 2016 Mayu was a guest artist with the Greek National Opera Ballet, performing the role of Giselle in Athens. Mayu started dance training in Japan. In 2002, she was awarded second place in the Junior Division of the Youth America Grand Prix in Japan and then third place in the Senior Division in 2004. She was also a finalist in New York in both years. She studied full time at the Royal Ballet School in Antwerp, and at Rock School for Dance Education in the USA. Prior to join the RNZB, Mayu danced with North Carolina Dance Theater before joining the RNZB. Outside her performing career, Mayu is active as a dance teacher, regularly presenting masterclasses alongside her husband, fellow RNZB Principal Paul Mathews.